Is it weird if I post about food? Can that happen here? I know I haven't really done it before, but that doesn't mean it's off limits, right? After all, cooking is a pretty major part of my "new job," a part that I really enjoy, and the only part on which I regularly get feedback. And if you don't mind my saying so, that feedback is generally positive. Plus, posting it here means that my desire to talk about this recipe will be satisfied, and I won't drive Dan crazy yammering on about it. So I'm going to vote yes. I can post about food. 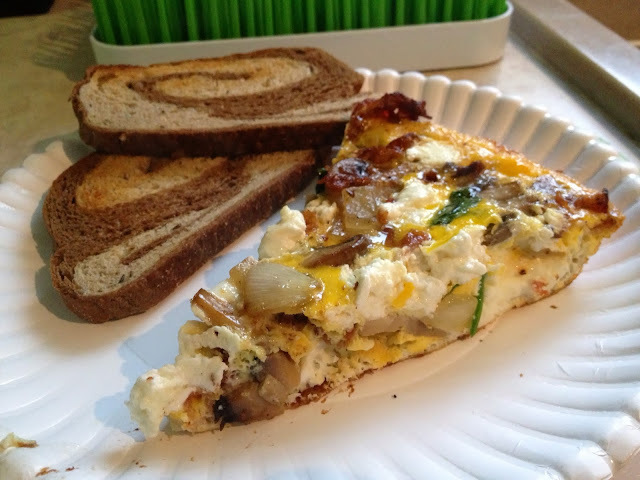 I can post this delicious frittata recipe. I've made this a handful of times, and it has been wonderful each time. 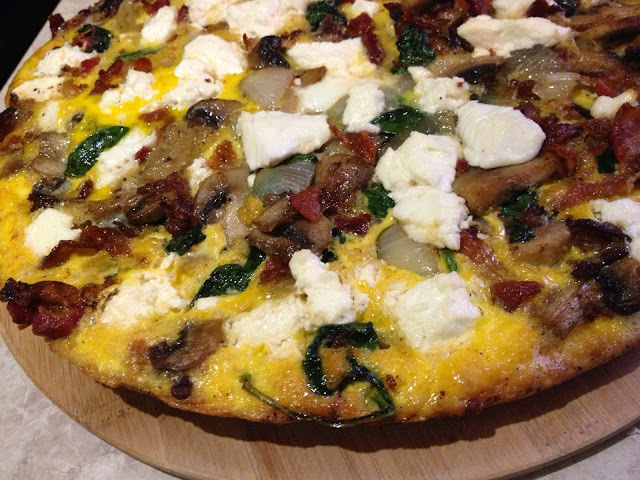 If you aren't familiar with frittatas, it's kind of like an egg pizza. It's a great option for a nice brunch, but also cooks up quickly enough to be an easy (and refreshingly out of the ordinary) weeknight meal option. 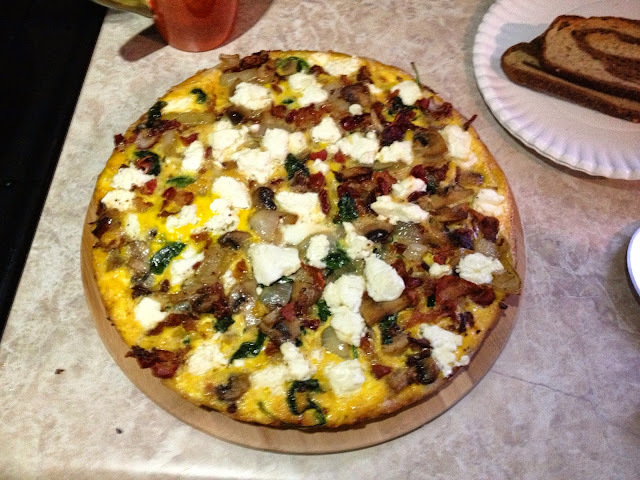 There's spinach, yes, (and mushrooms, if you want)) but there's also bacon...so it's gotten the DanHig approval. The goat cheese is what sends it over the top in my book...I love its heavy, creamy contrast with the salty bacon and eggs. Yum. Seriously. It's a real winner. -Grab a large, heavy, non-stick, oven-safe (yes, I know that's a lot of adjectives, but they're all important, I promise) skillet and cook up the bacon til it's crispy. Or chewy, if that's how you roll, but you'll have to implement a knife on the third step. -The bacon needs to be crumbled! Remove it from the pan, leaving the grease (stove top off), and either crumble it with your hands (careful if it's hot!) or cut it in to small pieces with a knife. Set it aside on a paper towel. -Place the onions and mushrooms in the pan with the bacon grease and sauté them until the onions are brown. Then toss in the spinach and let it cook just until it starts to wilt. -Use a slotted spoon and remove the spinach, onion, and mushrooms from the pan to the paper towel with the bacon. Toss with the spoon so that it all mixes together. -Next, pour the eggs into the pan and allow them to cook, without stirring, til the edges start looking solid. Do not scramble the eggs. -Using the spoon, scatter the spinach and bacon mixture over the cooking eggs. -At this point, if your oven is pre-heated, that baby is ready to go in! Place the pan, and everything in it, on a middle rack of the oven, and bake until the eggs have set, about 7-15 minutes. -Once the eggs have set, remove the pan from the oven. Slide the frittata onto a wooden board, and slice into wedges to serve. -Serve with toast, some fruit, and maybe a little orange juice! Enjoy! This recipe will yield 8 slices, and Dan and I each comfortably ate two for dinner, along with some rye toast. So let's say it makes 4 servings. And yes, we ate on paper plates. Judge me. No way!!!! I was thinking about that last night, wondering, "Hmmm, could Kayla eat this? Probably not...but maybe...I'm not sure..."
I'm totally making this if/when you come for dinner. Or brunch.